Your SpeedCurve test data is available via our Synthetic API as well as via an open-source tool called speedcurve2csv. Your Synthetic data is available within the SpeedCurve UI for one year. If you want to keep your historical test data, you can export it in JSON format via our API. For any chart you can also export a large PNG image designed to look good on a light or dark background and a CSV of all the data in that chart. Check out the options menu on each chart. 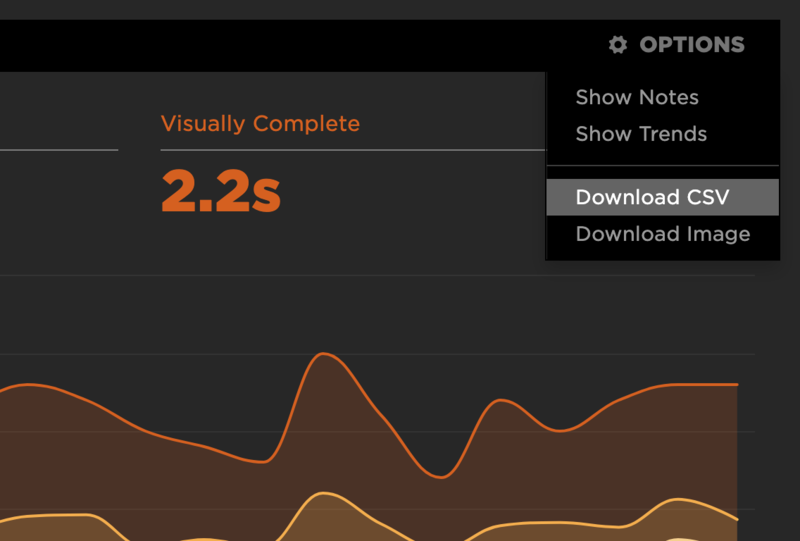 Matteo Fogli – CTO of MODO, and a Speedcurve power user – has created a tool called speedcurve2csv that allows you to export your SpeedCurve test data as a csv file. It's available here.